It must have been an odd scene: On a spring day in 1996, six music students from Oberlin College filed into Mary’s Hideaway, a greasy spoon frequented by truckers and bikers, and sat down over a meal of tater tots, biscuits, and gravy to decide whether they had a collective future. One of the six was about to move to Yale, to begin work on his master’s degree. The rest were going home for the summer, but would return to Oberlin. The six players—Matt Albert (violin and viola), Molly Alicia Barth (flutes), Michael J. Maccaferri (clarinets), Nicholas Photinos (cello), Matthew Duvall (percussion), and Lisa Kaplan (piano)—agreed that their repertoire interests and personal chemistry made performing together a joy, and that their instrumental arsenal afforded a flexibility that could give them access to an enormous repertoire. They quickly decided to continue working together, but recognized that the odds were against them. They had to overcome the challenge of having one player at Yale and the rest at Oberlin, for starters. And their calendar had only a single paying gig—a $100 performance for the Chicago Composers Consortium. 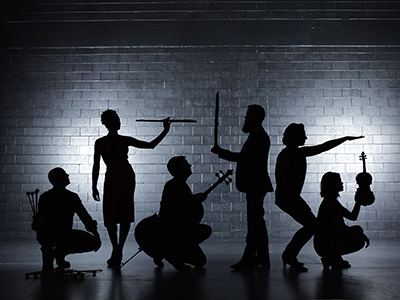 Two decades later, Eighth Blackbird, now based in Chicago, is regarded as one of the world’s finest new-music ensembles, and an important force in the new-music ecology. It has transformed itself from the ramshackle organization that most just-out-of-college groups are, into a tightly run ensemble with a board of directors, four full-time employees, and three interns. And it has a teaching arm: Having presided over residencies at colleges around the country, in June 2017, the group will unveil the Blackbird Creative Lab in Ojai, CA, at the Besant Hill School, a tuition-free program that will bring together performers, composers, and artists from other disciplines to study the practical side of creating new work, with particular attention to collaboration and entrepreneurship, processes that are among this group’s specialties. Their roster has remained remarkably stable for a 20-year-old ensemble: Only two of the original players—Barth and Albert—have moved on, Barth in search of a less urban setting (she now teaches at the University of Oregon, in Eugene) and Albert in search of a broader repertoire and a less peripatetic lifestyle (after several years leading the chamber-music program at Southern Methodist University, he moved to a similar position at the University of Michigan, in Ann Arbor, this fall). Barth was succeeded by Tim Munro, who left the group last year, ceding his place to Nathalie Joachim. Albert’s successor is the violinist and violist Yvonne Lam. Even so, when Joachim was unable to play a few concerts in Chicago, recently, Munro filled in. And when Lam was on maternity leave, early this year, Albert rejoined the group for performances that included a celebration at Zankel Hall of Eighth Blackbird’s 20th anniversary—a concert devoted to the New York premiere of Hand Eye, an ambitious, full-evening audio-visual production with works by the composers’ collective Sleeping Giant (Timo Andres, Andrew Norman, Robert Honstein, Christopher Cerrone, Ted Hearne, and Jacob Cooper). These are players whose interests are as piqued by composers’ back catalogues as by their latest works. When they recorded the prismatic, high-contrast Pocket Symphony that Frederic Rzewski composed for them in 2000, they could have matched it with other commissioned works. Instead, the group filled out the album—“Fred” (Çedille, 2005)—with Rzewski’s early exploration of minimalist techniques, Les Moutons de Panurge (1969), and one of his political manifestos, Coming Together, a 1971 work woven around a letter from a prisoner who was in that year’s Attica uprising. Other recordings in the group’s nearly 20-CD discography are more kaleidoscopically varied, including four that have won Grammy awards. Indeed, one of Eighth Blackbird’s most striking qualities is its non-doctrinal openness to all currents of contemporary style. The atonal lyricism of George Perle, or the mystical abstractions of George Crumb? No problem. Steve Reich’s rhythm-driven minimalism, or Philip Glass’s early additive-process works? Absolutely. The post-minimalist eclecticism of Michael Torke, Nico Muhly, Missy Mazzoli, or the Bang on a Can composers (David Lang, Michael Gordon, and Julia Wolfe)? It all suits these players just fine. And composers with a pop-music pedigree—Richard Reed Parry, of Arcade Fire, Glenn Kotche, of Wilco, and Justin Vernon, of Bon Iver, among others—are welcome in the group’s repertoire too. Eighth Blackbird has a touch of rock star DNA itself—or, at least, a flair for a brand of theatricality that enhances the music and seems intrinsic to it. When I first heard them, at their New York debut concert at Merkin Concert Hall in November 1998, I was stunned by the performance of Fred Lerdahl’s complex Fantasy Etudes that opened the program. The ensemble played it not only from memory—something chamber groups, let alone new music ensembles, hardly even attempt—but also with a flowing choreography that illuminated the score’s shifting timbral combinations and variegated gestures. Since then, I have heard the Blackbirds play perhaps two dozen times, and almost invariably, part of the program is performed from memory, often with staging or choreographic elements. I also once sat in on a rehearsal that was played entirely from memory, and it turned out that beyond internalizing the music’s substance, the players knew the locations of the printed rehearsal markings as well. When one stopped and said, “Let’s take that again from letter C,” the group immediately returned to the spot, without consulting the score.